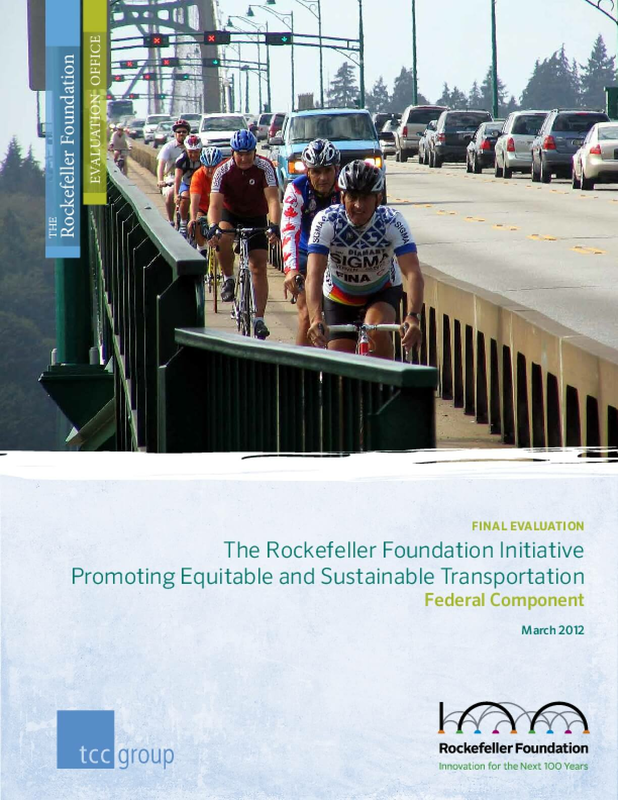 In 2008, the Rockefeller Foundation Board of Trustees approved $29 million in supportof the Initiative in Execution: Promoting Equitable and Sustainable Transportation.The Board increased this to $66.7 million in 2010. As of April 2012, the Foundation hadcommitted a total of $55.6 million through 151 grants. The Transportation Initiative aims to significantly alter the transportation environmentsuch that people living in the U.S. are healthier, have more disposable incomeand are safer as a result of smart infrastructure choices that create more communitiescharacterized by accessible and affordable transportation options; with equal accessfor all people to jobs, schools and amenities; and prioritization of energy efficiency,good air quality and healthy living. The identified "lever of change" is primarily federaltransportation policy, with a specific focus on informing the Surface TransportationReauthorization Bill. Beyond federal policy, there is an acknowledgement that stateand local governments have a significant impact on the ultimate use of transportationfunding and could be key advocates in advancing a new approach to transportation inthe United States (US). The evaluation of the Transportation Initiative comprises two main components:1. summative evaluation of the Initiative's effort to inform policy reform at the federal level2. mid-term, formative evaluation of the state-level work. Copyright 2012 by Rockefeller Foundation. All rights reserved.